Please note our brochures are constantly being updated to reflect the latest CDC/ACIP guidelines. They may NOT be edited or have photos or information taken from them for any purpose. They may be ordered below or you can print them out yourself from the PDF file. However if you print please fill out the form and check the box printed by user. This is our newest brochure. When ordering ask for the Meningitis Brochure. This brochure includes real teens (Meningitis Angels) talking about how vaccine preventable meningococcal meningitis has affected their lives in a personal way. This is part of our national launch to educate teens on this deadly disease. Our adult vaccine brochure is a comprehensive look at meningitis and other vaccines preventable disease and the vaccines to prevent them. Meningitis does not stop at the dorm room door. Adults being vaccinated help to protect those infants who are not yet vaccinated or those persons who can't be. See Our Posters 2. Several of our Angels were told they did not need vaccines because they lived off campus. They Died!! Please educate yourself. 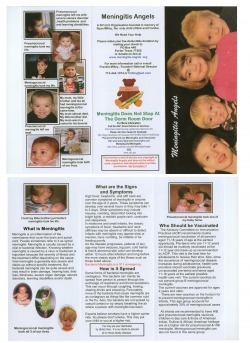 This brochure includes stories of real children (Meningitis Angels) who have been left debilitated or have died from vaccine preventable meningococcal and pneumococcal meningitis. You can read about these and HIB meningitis and how to prevent them.